If you are on the market for a grill there is no doubt that Napoleon should be on your radar if they aren’t already. 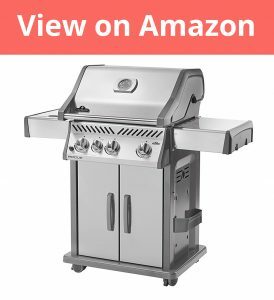 They provide premium quality grills and this Napoleon Rogue 425 follows this same pattern, but let’s see if it really lives up to the hype – now let’s get to my review. I have been fortunate enough to have used a plethora of different grills and when it comes to design the Rogue 425 really is top of the line. It looks fantastic with a primarily stainless-steel design I certainly haven’t seen anything quite dazzle in the sun like this. In terms of the design you have the cooking grids which too are made from stainless steel – because they are made from stainless steel they hold the heat better and are much easier to clean because of that. You have the hood which can be closed over when you aren’t using the grill or you can use it to get the maximum temperature to it’s true peak, you can also see the temperature thanks to the built-in thermometer to the hood itself which is a handy addition to have. On the sides you have shelves which can be used to prepare food or whatever you like. The shelves can also be folded down if you don’t have as much space or are wanting to store the grill over winter for example this will lower its footprint so it won’t take up all your storage space. On the underside you have the compartment which is mainly used for keeping the propane gas tank inside. Also on the underside you have wheels which make for moving the grill very easy over a hard or firm surface. The wheels can also be clamped to make sure it stays in place when it needs to. The final thing worth noting about the design is on the right side there is a small space to put condiments and this is useful especially if you are using the grill regularly. As this grill needs to be assembled some people may be warry of it not being an easy thing to do. While there are quite a few parts that need to be put together the instructions are well laid out and easy to follow – this means set up should only take 1-2 hours’ time as most. So really, it’s a simple enough job that anyone can do without much hassle. In terms of cooking power this grill has 45,000 BTU of power and is powered by 4 burners each of which can be adjusted individually. What that actually equates to in real terms in a maximum temperature of 700F when all 4 burners are up and running. Getting to this temperature doesn’t take long either – only a couple of minutes (2-3 minutes) before it can reach this temperature. The heat is quite evenly spread but there did some to be a little extra heat on the outside of the heat shields but it didn’t seem to make a massive difference. This grill cooks really well and gives really nice sear marks too. There is also a grease tray which catches the grease and it can be lined with foil which will help keep it in good condition for years to come I would imagine. Overall, I was really impressed with this Napoleon Rogue 425 and I would highly recommend it.